Standard Business translations give you everything you need from a translation and nothing that you don’t. We recognise you’re busy. One call to us and the problem goes away so you can get on with your day. Highly qualified and experienced, mother-tongue translators with knowledge of your sector produce and proof-read your translation. 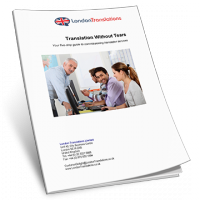 Your dedicated Project Manager owns your assignment end-to-end and ensures your translation is delivered on time, every time – ‘Late’ is not a London Translations word. Why choose a Standard Business Translation? All translations are not the same. It’s a fact, experienced translators who understand your sector produce dramatically better quality work. That’s why all members of our Standard Business Translation team have a minimum of 5 years relevant commercial translation experience and only translate into their mother tongue. Standard Business translators will be assigned to your project based upon their sector knowledge so you can be sure they fully understanding the meaning you need to convey not just the words on the page. Quality: Translators proof-read their work to catch mistakes.